Experience the true romance of the ‘Raj’ coming back to life at The Bison, a Bush Betta luxury tented camp that bears testimony to the timeless Man-Animal conflict synonymous with African adventure. 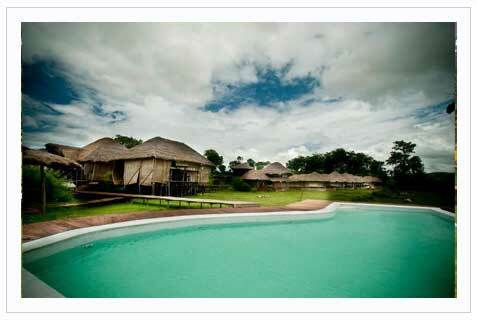 Located on the shores of the exotic Kabini river, the camp offers you the perfect wild life adventure. The Bison is a consequence of Bush Betta’s continued quest to give back to wilderness, its glorious past. This adventure trip into the bush is not only going to give you an adrenalin rush but also an opportunity to help you be part of a movement of saving our environment in a sustained manner. The people at camp - True people of the bush, colourful characters, man the camp. Dumi Sakuijne - A Shangaan Chief of the Sakuinje village in Zimbabwe, with extensive experience of managing wildlife camps in Africa will be your host. Nawabzada Saad Bin Jung - Former Cricketer, Wildlifer, Eco-tourism operator, Columnist, Novelist, Angler, Royalty - is a jungle-man who has implemented and established ecotourism as an integral tool for conservation since 1988. He owns Bush Betta. Riad Fyzee - A wildlifer whose foundness for the wilds is known to all, a person with extensive experience in trekking and camping in the Himalaya's, is a co-founder of The Bison. The above cost is inclusive of accommodation, all meals and taxes only. Children between 4 to 12 years sharing the accommodation is 50 % of the adult. Tariff is for Resident Indians only and separate rates for foreign nationals. Per person on twin sharing basis for foreign nationals. All wildlife activity charges extra. Take the H.D.Kote road and once you touch Handpost (Around 50 minutes from Mysore) proceed straight on the Mannantvady road. Cross Karapura and get to Gundathur village (45 minutes). At Gundathur turn into "The Bison"